I don’t think I ever had a really warm jacket before. Which is weird, regarding the fact that I have lived in Berlin for almost all my life, where it gets super icy in the winter. Somehow it didn’t even occur to me that there is such thing. I have been quite happy with my Irie Daily coat for several winters now, but when the temperature drops below zero it’s just not warm enough. This year I decided to get a decent winter coat, and when I found a special offer on this hoodlamb nordic parka, I couldn’t resist. It arrived a couple of weeks ago, in September, when I was still wearing flip-flops, it was still sunny at 7 p.m. and the idea of ever needing a coat like that seemed just as absurd as the ginger bread popping up in the supermarket. I took it out of the box and thought, wow, heavy! I put it on and it looked supercool. Then I zipped it up and posed around with the hood. Now that it’s getting cold I really appreciate my hoodlamb coat. I got into heavy rain the other day, but the herringbone surface is absolutely waterresistant. The hood is adjustable and stays where it belongs, even when it’s windy. I don’t even need a scarf, hat or gloves, the coat has everything covered and the pockets are lined. It is so warm, I have to take it off immediately when I come into a house. 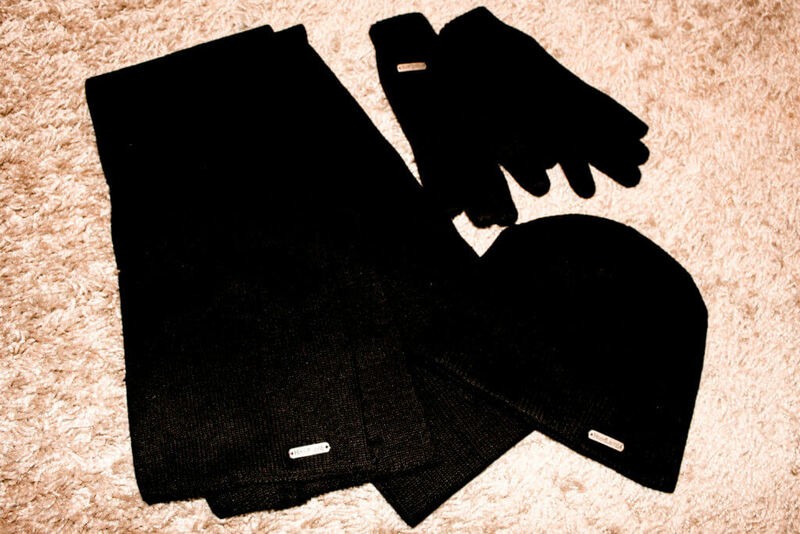 Hoodlamb recently had an accessories sale and I got a scarf, a hat and gloves in black. I haven’t had a matching set for ages, so I couldn’t resist getting them for my old travel jacket. Because as much as I love the Hoodlamb, it’s quite voluminous and takes up too much space in my suitcase. So unless I’m going to Russia or Montreal or Chicago, it stays at home and my lighter Irie Daily coat comes with me. I’m still not really sure about the hemp fur, to be honest. I removed it from the hood for now. It looks very pretty of course, and when it snows it will keep the snowflakes out of my face. Unfortunately there are so many winter jackets with real fur, or even fake fur that is made in china, which means that it might be real too, because that’s cheaper (WTF? Click here). I wouldn’t want anyone to think I’m wearing something like that. What I want to do about that dilemma? I want to help make this Dutch brand so famous that everyone recognizes the logo on my sleeve and knows that this jacket is 100 % vegan. Made of natural hemp and organic cotton, vegan down and recycled PET, fairly produced and sustainable. I want everyone to know that you don’t need real fur or down for a quality warm jacket, and you don’t need to support intransparent companies. Have a look at Hoodlamb’s website here. They might not be cheap, but I know I will wear mine for many years. And the Canada Goose or Woolrich jackets still cost way more, not just money, but also the lives of other beings. I hope that real fur will soon be banned in Germany and everywhere else, I mean, why is it even still allowed! The subject is on in Los Angeles and in the UK and hopefully other countries will follow. 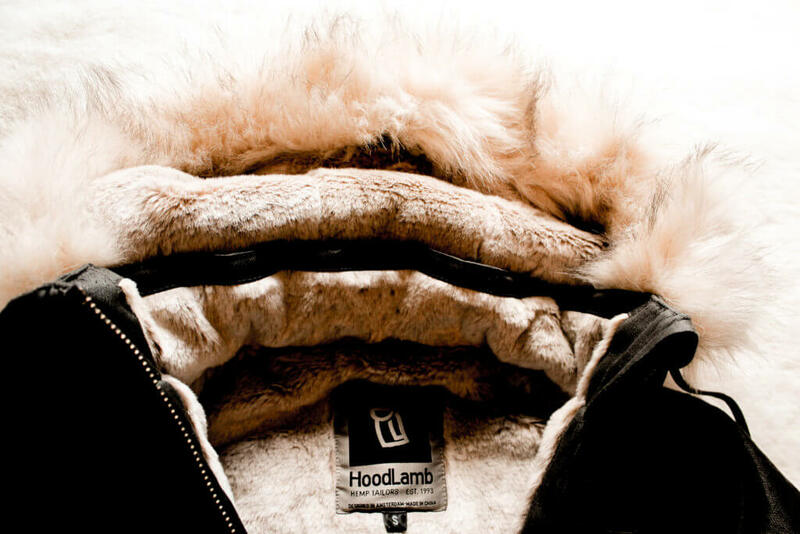 And then I’ll be happy wearing my hoodlamb with the hemp fur. But for now? 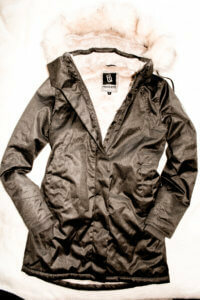 What do you think of the hemp fur? Would you wear it or remove it?